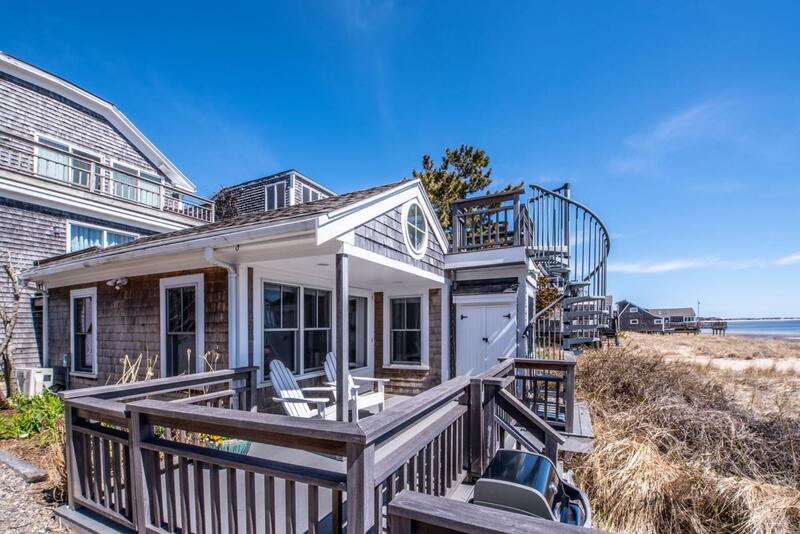 423 Commercial Street U4, Provincetown, MA 02657 (MLS #21902612) :: Rand Atlantic, Inc.
East End Waterfront... Often referred to as the Beach Rose Cottage, this magical condo is quintessential Cape Cod. Beach cottages remind us of times gone by when life was simple and carefree. The Beach Rose Cottage is no exception, but along with fond memories come all of today's modern conveniences.The cottage has been completely renovated to include kitchen with granite countertops and stainless appliances, bath with beautifully tiled floor and shower, pine floors in living room, kitchen and bedroom, and a cathedral ceiling in the living/dining area which adds to the open and bright feeling of the space. Best of all are the breathtaking views from every room in the cottage, the front porch and the rooftop deck. And, a real bonus is the convenient parking space adjacent to the cottage.Imagine starting your day with coffee on the porch overlooking the bay and enjoying a drink on the roof deck before dinner in the evening. It really doesn't get much better than this. Beach Rose Cottage is a smartly designed free-standing one bedroom condo located in a small 4 unit association in the Gallery District. Because it is tucked away in the back of the complex and faces the bay, it feels very private and serene, yet it is just a short distance from many popular restaurants, shops and galleries. Features include exclusive use washer/dryer and storage in the basement of the main building, oil heat, split A/C, and connection to the Town sewer. With lots of charm, an abundance of sunlight streaming through the windows on sunny days, stunning views come rain or shine, and the beach as your front yard, this hidden gem is truly a little piece of paradise. Pets are permitted and, not surprisingly, this cottage has an amazing rental history. Come take a look! Listing provided courtesy of Brenda F Dean of Cove Real Estate.